• Newly elected House picks president from top three Electoral College vote-getters. • Newly elected Senate chooses vice president from top two Electoral College vote-getters. • In 26 states and Washington D.C., laws require electors to follow the popular vote. • Some states threaten penalties for "faithless electors." No one has ever been prosecuted. A candidate must receive an absolute majority of electoral votes (currently 270) to win the Presidency. If no candidate receives a majority in the election for President, or Vice President, that election is determined via a contingency procedure in the Twelfth Amendment, which is explained in detail below. The number of electors in each state is equal to the number of representatives and senators the state has in the United States Congress. In the case of representatives, this is based on the respective populations. Each state's number of representatives is determined every 10 years by the United States Census. In the case of senators, each state is entitled to two. Under the Twenty-third Amendment, Washington, D.C. is allocated as many electors as it would have if it were a state, but no more electors than the least populous state. The least populous state (Wyoming, as of 2011) has three electors; thus, D.C. cannot have more than three electors. Even if D.C. were a state, its population would entitle it to three electors; based on its population per electoral vote, D.C. has the second highest per-capita Electoral College representation, after Wyoming. Currently, there is a total of 538 electors, there being 435 representatives and 100 senators, plus the three electors allocated to Washington, D.C.. The six states with the most electors are California (55), Texas (38), New York (29), Florida (29), Illinois (20) and Pennsylvania (20). The seven smallest states by population—Alaska, Delaware, Montana, North Dakota, South Dakota, Vermont, and Wyoming—have three electors each. This is because of these states' entitlement to one representative and two senators. 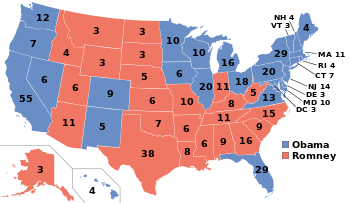 The Electoral map above is the final tally of electoral votes for all the states in the 2012 election. The only state with a considerable number of electoral votes won by Mitt Romney was Texas, and winning that state was no surprise as it traditionally goes Republican each election. But what counted for Obama was Ohio, Pennsylvania,California, New York along with a host of others that swung the vote to Obama. Interestingly enough, the Republican candidates of Romney and Ryan could not even win their home states, but Obama won his home state (Hawaii).